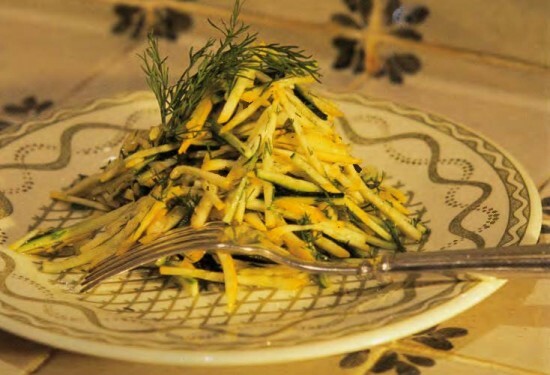 For this recipe you’ll need a mandoline – the domestic models with a plastic frame do just fine. Endive and lamb’s lettuce are among the treats of winter, a glimpse of green among the seasonal roots on the vegetable stand. 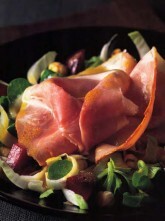 Teamed with beets for color and hazelnuts for crunch, they are a classic French combination, delicious with thinly sliced Virginia or Smithfield ham, or some imported prosciutto. For best effect, arrange alternating slices of pears and fennel in a fan shape on the plate, then add shavings of Parmesan cheese. To this very Italian combination, I like to add some pinenuts. You may be able to find them ready toasted, but if not they are much improved if you have a chance to brown them in a dry, nonstick frying pan on top of the stove for 2-3 minutes. Take care as they scorch easily. This salad can act as appetizer, dessert, or even a light main course if you add a bit more cheese. Read the full recipe after the jump! 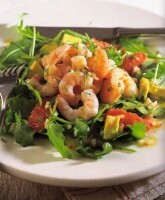 The pink of shrimps and grapefruit with the green of avocado and arugula make a cheerful welcome in hot weather. To whip up a quick lunch, prepare the citrus dressing ahead of time and keep at room temperature. Right before lunch, follow the recipe to prepare the grapefruits, arugula, and avocado. Toss everything together with a side of toast for a light summer meal. I think you’ll be surprised by how well this simple little salad pulls together on the plate. 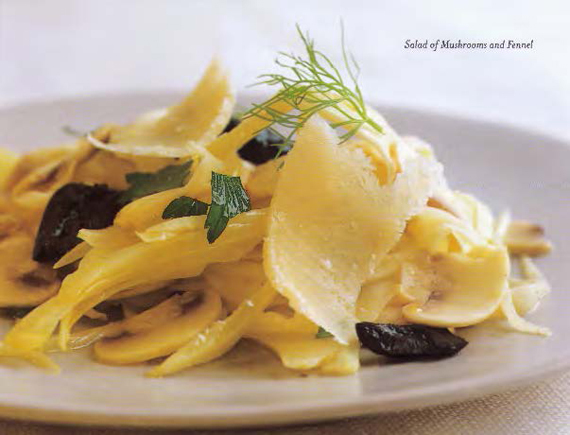 Be sure the mushrooms are fresh so they show white and firm beside the pale green fennel. The country habit of marinating little goat cheeses in herbs and oil (olive oil along the Mediterranean or nut oil where walnuts do well) has recently gone global. It is hard to resist when the cheese is toasted to a bubbling brown, then served on a salad dressed with the oil from the marinade. 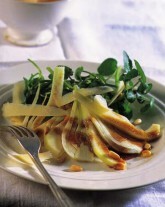 Tart salad greens such as arugula stand up best to its lively taste. This classic Russian salad includes the beet tops as well as the vivid pink roots. 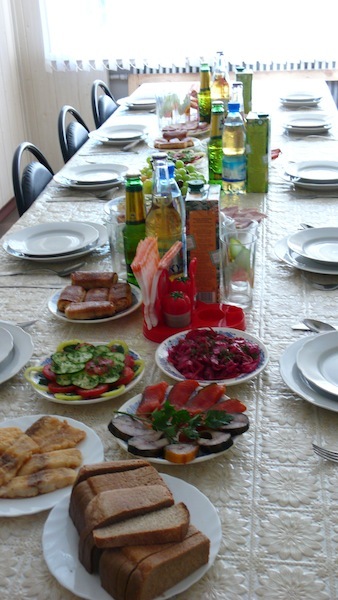 In Russia it forms part of zakuski appetizers alongside small dishes of sliced salami, smoked fish, pickled cucumber, and tomato salad. I like to serve the salad with cooked ham, or cold pork, chicken or turkey as an entrée salad. If your beets don’t have tops, substitute a few leaves of spinach or chard. 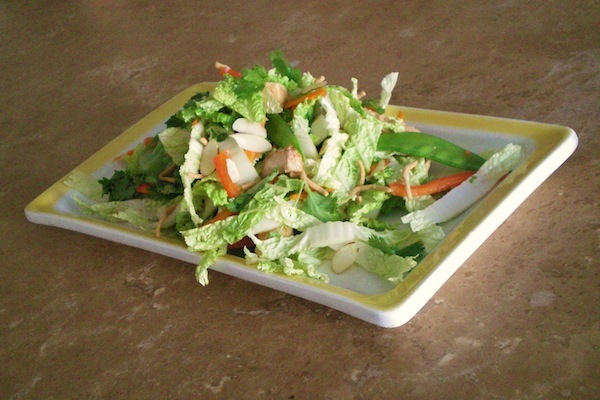 Here’s my favorite version of this multi-cultural salad which includes a typical Californian mix of spicy grilled chicken with Asian Napa Cabbage and snow peas with shreds of carrot and red bell pepper tossed in a sweet sour sesame dressing. Sliced almonds and crispy Chinese noodles add texture.